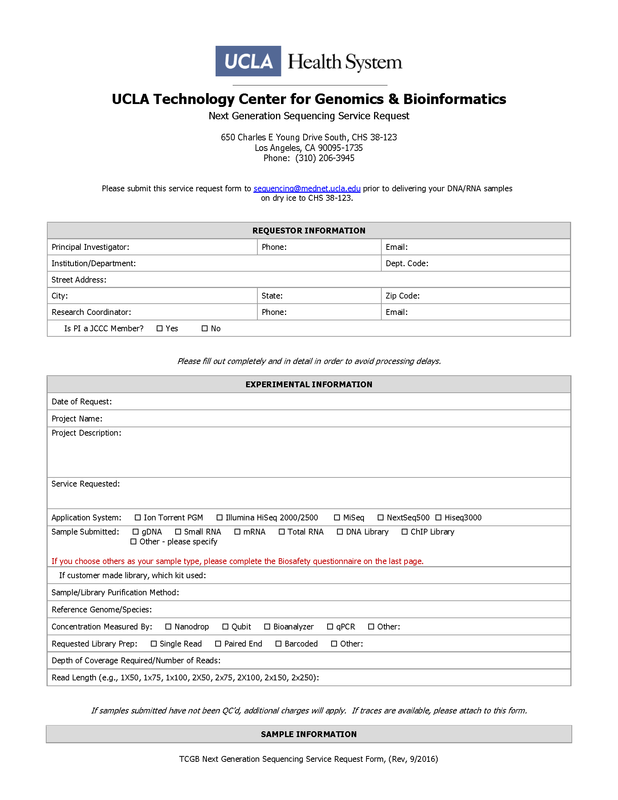 Download the appropriate service request form [located to the left]. Complete all required fields electronically. Input your sample ID with letters, digits, dashes and/or underscores. We prefer no spaces, slashes or any other characters to be used for the sample name. 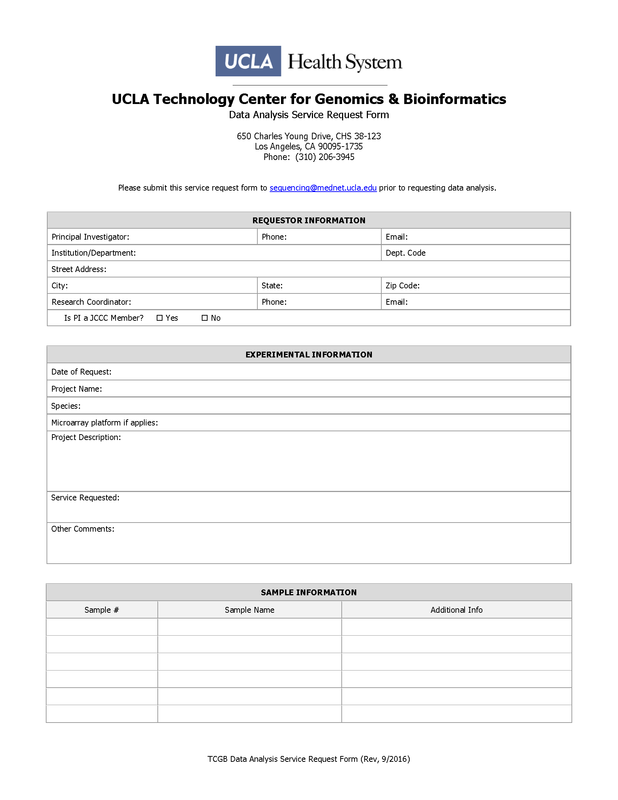 Email the completed form as an attachment to sequencing@mednet.ucla.edu. The TCGB staff will follow up with you by email regarding your request. Please use the following kits in preparing your sample(s) for testing. For miRNA isolation, use Qiagen miRNeasy Mini Kit (cat #: 217004). For RNA/DNA isolation, use column-based purification protocol, such as Qiagen RNeasy Mini Kit (cat #: 74104) or Qiagen RNeasy Micro Kit (cat #: 74004). Please note that RNA isolated by using the Trizol method needs to be purified using Qiagen column. For Single Cell 10X Library construction, re-suspend sorted or disassociated cells in 1xPBS+0.04%BSA solution (for nuclei use 1xPBS+1% BSA). The ideal concentration for single cell capture is 700-1200 cells/µl. If a sample contains a high percentage of EDTA or surfactants, please wash the sample twice (300 rcf, 2 minutes) with 1xPBS+0.04%BSA (1xPBS + 1% BSA for Nuclei) before you make the final single cell suspension. Prior to shipping, please contact the laboratory at 310-206-3945 to schedule delivery. At the time of shipping, please send an email notification with tracking number. This will allow our team to watch for your shipment. We prefer that samples be sent overnight on Monday or Tuesday to guarantee their receipt. We will notify you by email when your samples are received. For 10X single cells library construction, please call us at 310-206-3589 or 310-825-3664 one hour prior to delivery of the sorted cells to allow us to thaw the reagents. Researchers will be granted access to all hybridization images and raw data. 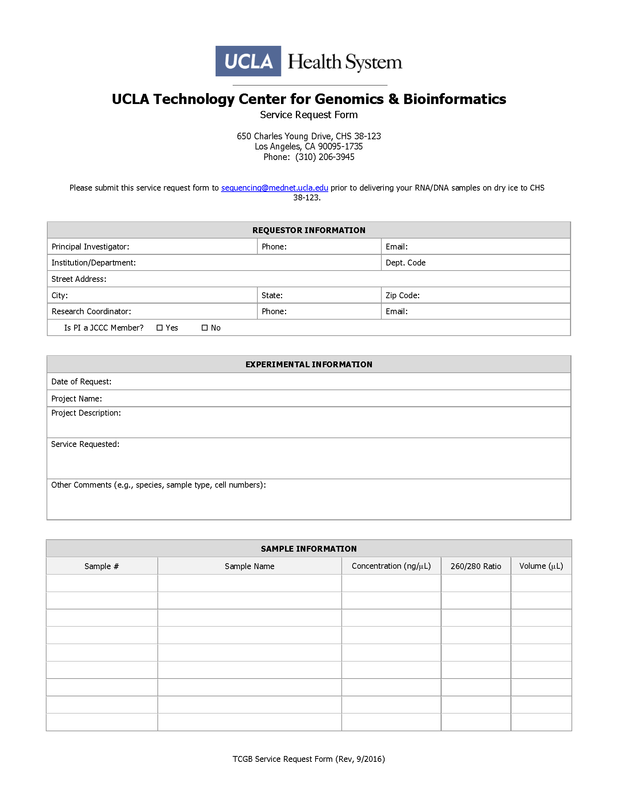 You can request a data analysis from TCGB. 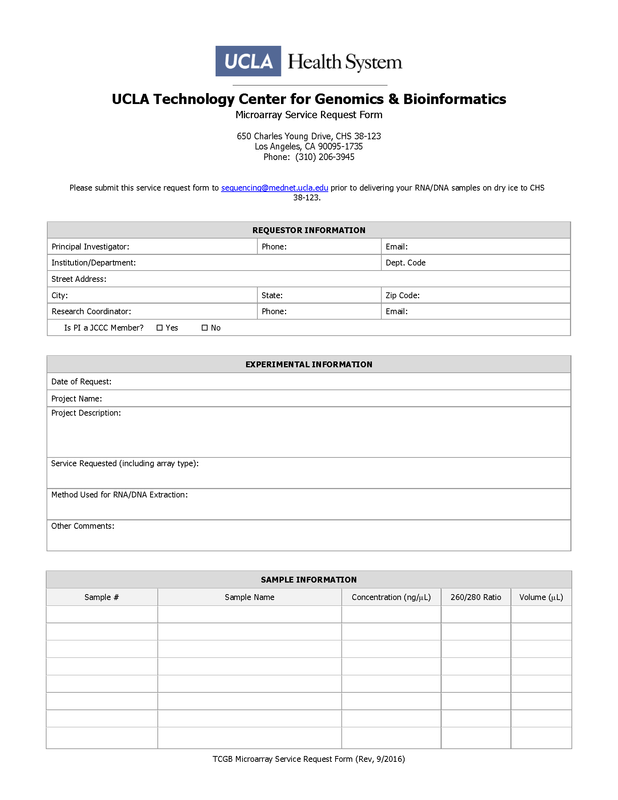 You can also take advantage of additional bioinformatics tools to assist in mining, modeling, or additional analysis.